Designed to be simple to use and to maintain, the Axiom F6 Datalogger eliminates the need to take a laptop and cables into the field because it incorporates an easy to operate, touchscreen user interface. With no laptop malfunctions, dead batteries, or forgotten cables, our customers make fewer on-site maintenance visits, saving significant amount of time and money. 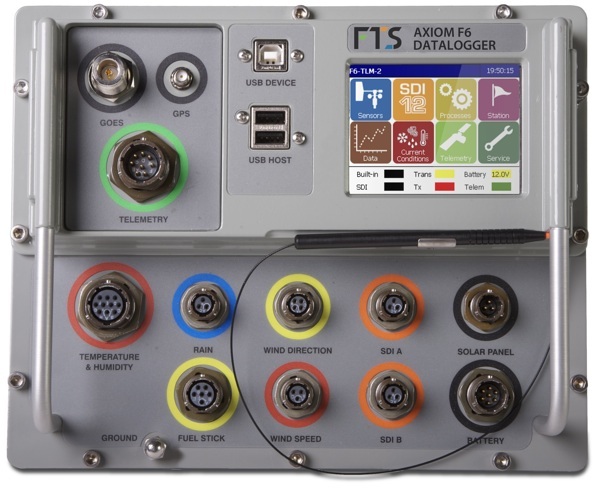 The Axiom F6 Datalogger can be configured with GOES/Meteosat and/or AirTalk radio voice communication to provide on-demand weather conditions and alerts via a digitized voice directly to a hand-held short-range radio.